Rhodos is the largest island of the Dodecanese and is situated in the south-eastern part of the Aegean Sea. The strongly elongated territory contains mountains and valleys and plains full of olive trees, together with sandy and stony beaches. Due to the fantastic infrastructure the islands allows for challenging mountain bike tours, for example from coast to coast, through natural settings, along clear blue coastal waters and magnificent forsts. 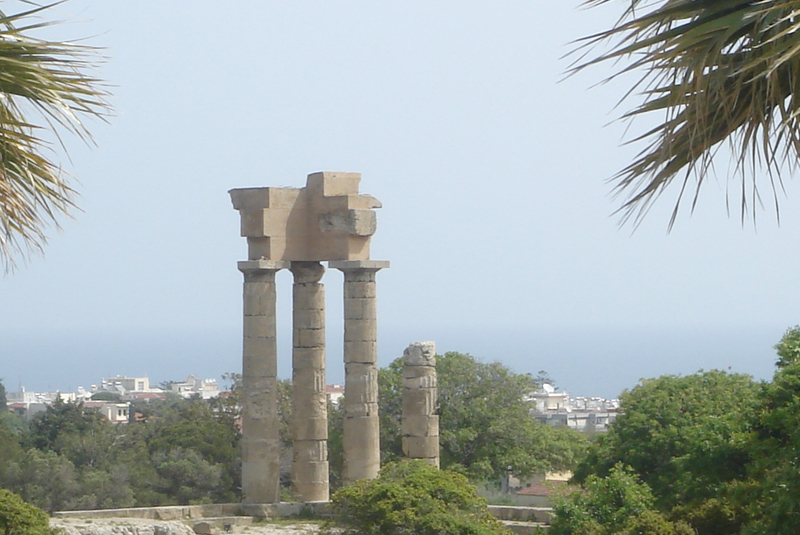 In addition, the experiences during the tour will allow you to become familiar with the Greek culture and its nature. In addition, the enormous hospitality by the local people will make you enjoy the fine culinary cuisine! This program entails various mountain bike tours, leading over the entire island along paved roads as well as off-road. From our support team the guides will take you on a discovery trip; they know the Rhodos history and culture from inside out and at the same time are throroughly skilled mountain bikers, who will teach you many additional skills to improve your style and biking qualities. This mountain bike challenge also teaches you specifics of the Greek language, becoming useful during visits to Rhodos and Lindos City. When sufficient participants register, dates are available in April, May, June, September and October 2020.
and the number of people per accomodation. Upon arrival a bus transfer will take you to your accomodation in Genadi, some 65 km in southern direction. Here you will meet your guides and fellow mountain bikers. In the afternoon we organise a first tour to get familar with the surroundings. You will be transferred to the starting point of today’s 65 km mountain bike tour near Butterfly Valley. Along rural asphalt covered roads with hardly any cars, we enjoy the beautiful landscape with coniferous and olive trees. 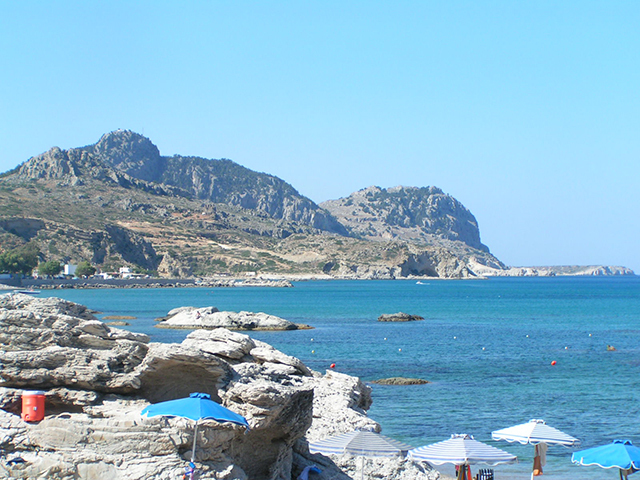 Rhodos’s west coast offers stunning views from a wide variety of sight seeing points. On the way we visit a church from the 16th century and learn about local religious traditions. Unpaved roads lead us through orchards of oranges and olives to a small village, where we enjoy Greek coffee in a traditional coffeeshop known as ‘kafeneio’. We continue along flat, but still unpaved roads in the interior of the island and pass by various small villages. Finally, the territory challenges us to bike up and down along sandy slopes of the forst nearby Filerimos. Two options are offered here: either continue by mountain bike to Filerimos or a car transfer to a nearby archeological site. The group will team up again in Filerimos, where we descent (either by mountain bike or by car) to enjoy lunch on the beach of Ialyssos. Next we continue our mountain bike tour along flat, sometimes moderately sloping roads through several small villages in the interior of the island. Finally, a optional bus transfer might take us back to our accomodation in Genadi. 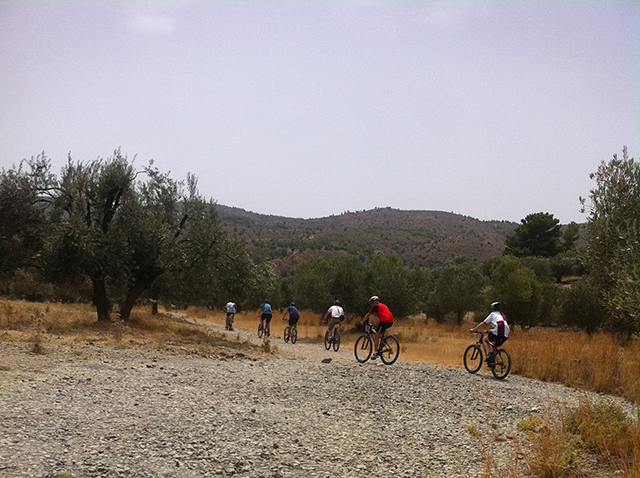 After breakfast we will be transferred to Lachania, the starting point of today’s mountain bike tour. We take off and bike along narrow streets and the marketplace of this typical Greek village with its corresponding architecture. Next, off-road paths lead us to the abandoned Italian village of San Marco (1920). We enjoy a little break and visit some interesting ancient buildings and learn about the local history here. The afternoon takes us over mainly unpaved roads to a nice sandy beach, where the crystal clear water leaves us the opportunity to refresh and recover from the physical efforts earlier today. On the way we pass by a small 15th century church that represents important characteristics of Greek traditional feasts and festivities. Those who choose to do so, can stay on the beach, others have the option to mountain bike through splendid landscapes. This physically challenging tour will finally bring us back to the beach to enjoy lunch together. Towards the end of the afternoon we will be transferred back to our accomodation. Free leisure time in the morning and following lunch the afternoon offers an opportunity to take some Greek language classes. Around 16.00 h a bus transfer brings us to Rhodos City, the medieval capital of the island with its fortress and castle and since 1988 part of the UNESCO world heritage program. It is enchanting to strole through the narrow streets of this magnificent ancient city along the northern coast of the island, so inviting to learn about the historically important medieval influences. Rhodos City offers many tourist attractions: Byzantine churches and Turkish mosks, a well developed archeological museum nearby its harbour, a Museum of Anthropology and the Grandmaster’s Palace. Following an historic tour through the city a 20 km coastal road leads us to the beach of Ialyssos, where we will enjoy dinner in a local restaurant. A 27 km bus transfer will take us to this morning’s starting point: Monolithos on the west coast of Rhodos. Spectacular views over neigbouring islands accompany us during our mountain bike tour along flat but mainly unpaved roads and ending in the middle of a dense forest. A small 15th century church and a recent archeological site will attract our attention and invite us for short breaks in the program. We continue along asphalt covered roads via various small villages until we reach the Apolokia Dam. Following a small snack nearby the dam we mountain bike to a nearby sandy beach, where today’s trip comes to an end. Around 16.00 h a bus transfer will bring us to Lindos, the picturesque white village with its numerous narrow streets and alleys that really invite you for pleasant stroles. Lindos is a trade village for the many ships that land there and its Akropolis offers an exciting tourist attraction symbolizing the convergence of several ancient cultures. 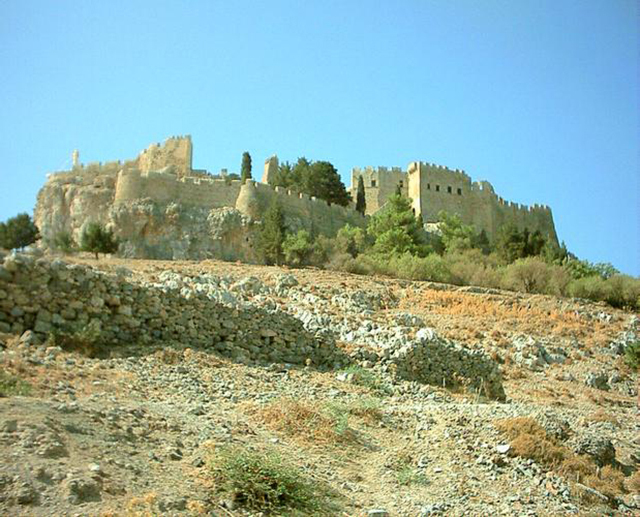 We will visit Lindos castle that is located on a 116 m high triangular rock. Lindos contains many traditional ‘Captain Houses’ out of the 16th, 17th and 18th century. These houses have been well restored and renovated and attract many tourists each year to Lindos. Thus, we will enjoy an interesting guided tour as well, before returning to our accomodation. After breakfast a bus transfer will take us to today’s starting point, where our mountain bike tour begins with a descent through Malona Orange Grove and leaves us the opportunity to visit medieval small churches in nearby villages. We mountain bike along the Gadoura River and while enjoying the view on its spectacular fall, and continue to the natural origin of this stream. Next, we are surrounded by the many olive trees of local orchards and cruise on to the vineyards nearby Masari, the village where some of the best wines of Rhodos are produced. Then the Gadoura Bridge, built by the Italians early 1930, that allows us to visit Second World War merlons. Leaving us the possibility to recover from the physical efforts, we rest a bit nearby this old bridge, before continuing over dry river bed paths along the landing strip of an abandoned airfield in the direction of Haraki beach. This forms the ideal location to end today’s mountain bike tour: a refreshing dive into the deep blue water of the sea and a smashing dinner with all kinds of Greek bites and snacks. Today’s program is mainly dependant on the actual time of departure. If times allows for a short mountain bike tour or a cooking class with subsequently enjoying a typical Greek meal, we will do so. In the end a bus transfer will take us to Rhodos International Airport for our flight back to The Netherlands. From € 990,= per person, depending on the choice in accomodations (Premium Appartments, Executive Appartments or 4/5-Star Hotels) and the number of people per accomodation. Prices mentioned include the activities of the DAY TO DAY PROGRAM, but can be adapted according to tailor-made wishes and needs, of course for extra-costs.